In the previous chapter we had learned about Autoworing. In this chapter, we will discuss about the different ways we can do the Autowiring. There are 5 modes in Autowiring but 3 specifiers are available. return "IPhone [version=" + version + ", ram=" + ram + "GB , iosVersion="
return "RearCamera [description=" + description + ", megaPixel="
Spring try to match java property name with Spring bean Id. So, in this example IPhone has property name camera now Spring try to search Spring config file with bean id camera. It founds RearCamera and wire the same with IPhone. 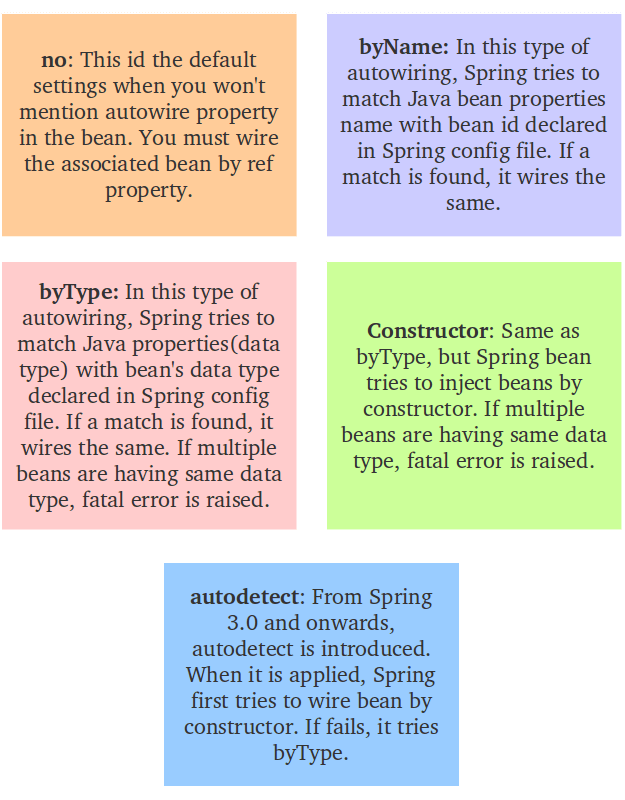 Spring try to match datatype of java property name with Spring bean type. So, in this example IPhone has property name camera whose datatype is ICamera now. Spring try to search Spring config file type ICamera. It founds RearCamera as it implements ICamera, and wire the same with IPhone. Spring try to match datatype of java property name with Spring bean type. So, in this example IPhone has property name camera whose datatype is ICamera now Spring try to search Spring config file type ICamera. It founds RearCamera as it implements ICamera, and wire the same with IPhone. Now, we will see if multiple beans are in Spring config and we Autowire by Type , then Spring throws any exception or not? To replicate that problem, we will add another bean into Spring-config file. Let us call it, Front Camera. Spring Container says that it founds two bean of same datatype. Now, container is confused about which one it takes. Be careful about this scenario when you set Autowire byType.